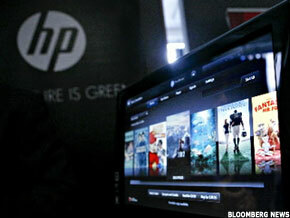 H-P's second-quarter results come at a crucial time for the computer maker and its investors. PALO ALTO, Calif. ( TheStreet) -- Hewlett-Packard's ( HPQ - Get Report) second-quarter results, released later today, come at a crucial time for both the computer maker and its investors. Long synonymous with PCs, printers, and servers, the tech giant has serious designs on the infinitely sexier smartphone and tablet markets. H-P's recent $1.2 billion acquisition of ailing phone maker Palm ( PALM was a bold move designed to boost the company's consumer business. H-P's stock, however, has plunged almost 12% over the last four weeks, a victim of the broader tech selloff, not to mention nervousness about the Palm deal. This undoubtedly presents a buying opportunity to investors, particularly in an improving economic climate. A number of analysts currently rate H-P a buy, including Broadpoint AmTech, which cites the rapidly-improving PC market as a major catalyst. This sentiment is echoed by Goldman Sachs, which also points to increasing budgets for data center gear. "Our latest indications of pent-up demand once again show hardware as the standout, consistent with our positive view on PC and server refresh cycles," wrote analyst David Bailey, in a note released earlier this month. "H-P continues to gain PC share and is benefiting from its renewed focus on large enterprise accounts and leadership position in notebooks." Technology research firm IDC recently reported that, during the first quarter of 2010, the worldwide PC market grew 24% compared to the same period of last year. More specifically, H-P's PC business was up 20% on the prior year's quarter, it said. Set against this backdrop, analysts surveyed by Thomson Financial expect H-P to report second-quarter revenue of $29.82 billion and earnings of $1.05, a marked improvement on the same period last year, when the company brought in sales $27.4 billion and earned 86 cents a share. While H-P's PC business is a known quantity, the tech bellwether is eyeing new market opportunities following its Palm purchase. Smartphones, in particular, present an array of new challenges. H-P has been selling smartphones for some years, although its iPAQ offerings have barely caused a ripple compared to Apple's ( AAPL iconic iPhone and Research In Motion's ( RIMM popular Blackberry. Will Palm and it WebOS operating system provide the launch pad from which to attack these smartphone giants? With a cash haul of $13.7 billion exiting the first quarter, H-P certainly has the financial muscle to support its smartphone push, but will need a serious injection of street cred if it wants to challenge Apple. Analysts recently surveyed by TheStreet were nonetheless positive on H-P's Palm prospects, although it will be some time before investors see the true impact of the deal. The transaction is expected to close during H-P's fiscal third quarter, which ends on July 31. H-P, which revised its recent first-quarter results, is also ramping up its efforts against networking rivals Cisco ( CSCO and Juniper ( JNPR. Last year Cisco riled its long-time partner H-P by entering the server market, and the two former buddies are now daggers-drawn. Last year, the computer maker even threw down $2.7 billion to buy Cisco rival 3Com. Largely overlooked in the brouhaha surrounding the (much smaller) Palm deal, the 3Com acquisition is nonetheless expected to boost H-P's presence in the booming Chinese technology market. PCs and servers are likely to grab the headlines when H-P reports after market close, but smartphones and China are looming large on the horizon. H-P CEO Mark Hurd may have earned a fierce reputation for cost containment during the recession, but he's clearly focused on the next big growth opportunities. For investors, H-P could make a compelling long-term play.